This splendid, old restored stone house is built into a hillside, with magnificent sweeping views over the dramatic White Mountains and the Askifou Plateau beneath. The villa has a living area of 220sqm and is suitable for up to 12 people, with four bedrooms, and a separate galleried studio. Beyond the small pretty swimming pool of 36sqm including a children’s end, there is a lovely shady pergola with a dining area. Two full flights of stone steps lead down to a big stone flagged terrace, past the pool and barbecue areas, to the main entrance. One enters a handsome spacious living/dining area, with a stone fireplace, satellite TV, and two built in sofa beds. From here a few steps lead to a bedroom with a double iron bed, a corner Jacuzzi bath and a screened off WC. From the living area a wooden staircase leads to a double bedroom, and a shower/WC. At the other end of the living area there is a charming small kitchen, with a stable door to the terrace, equipped with large fridge-freezer, dishwasher, full cooker and an old stone oven. A wooden staircase leads to the upper floors. There is a large bedroom with a double iron bed and above this a spacious seating area with two single sofa beds. Beyond this, steps lead to a huge gallery bedroom with a four-poster bed made from an old loom. Below the gallery there is an antique style bath, and separate WC, in addition to a well-equipped kitchen with full cooker, large fridge-freezer and dining area with satellite TV. A wonderful large sun terrace can be reached from here and this second area has its own private entrance. Further, by the pool there is a shower, and a separate WC with washing machine. 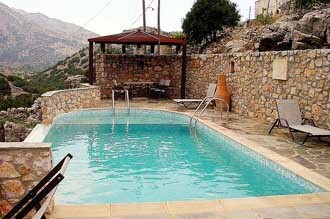 Villa Askifou is equipped with central heating for cooler times of the year (without extra charge). Scattered on the hillsides, around the house, are the ruins of old village dwellings, but the area of Askifou and its little villages offer a fine and authentic community atmosphere. There are a number of tavernas in the area, some shops, a petrol station and a village bakery. The nearest beaches and further amenities can be found at Georgioupolis (20 km away) or at Sfakia (18 km away).